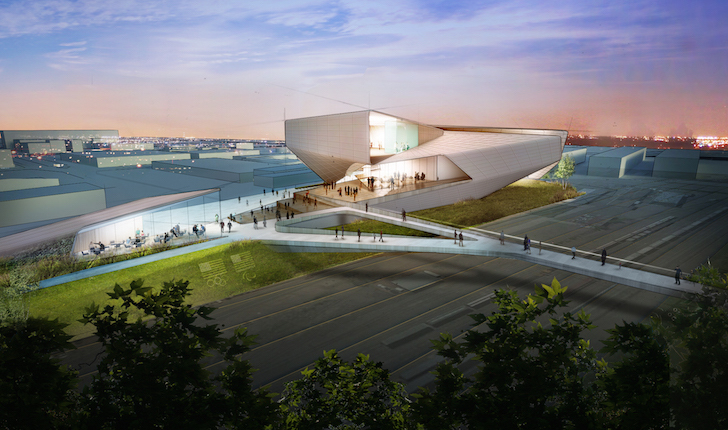 New York studio Diller Scofidio + Renfro has revealed their concept for the United States Olympic Museum, scheduled to open in downtown Colorado Springs, CO before the 2018 Olympic Winter Games. The renderings for the 60,000 square foot space show sweeping curved lines, elevated walkways and an extensive outdoor public plaza with views of Colorado’s Pikes Peak. The building’s spiraling shape reflects was inspired by the fluid movement of Olympic athletes and it will act as a brilliant commemoration of the Olympic games. “Inspired by the movement of athletes, the United States Olympic Museum spirals up and outwards from a central atrium, drawing the public in at its base and propelling them up through the galleries. Expressed in two parts of one body in counterpoise, the building frames a new downtown public plaza below the view of Pike’s Peak, and extends a new axis to the America the Beautiful Park West,” comments Elizabeth Diller, a founding partner of Diller Scofidio + Renfro. The museum is to include the United States Olympic Hall of Fame, a theater, a 20,000 square foot exhibition hall housing interactive exhibits, a broadcast center, and a retail space for the sale of commemorative merchandise. Ground breaking on the new space is set for spring 2016 and the museum is scheduled to open before the 2018 Olympic Winter Games, which will be held in Pyeongchang, South Korea. The US Olympic Museum, in downtown Colorado Springs, CO, will extend a new axis to the America the Beautiful Park West. 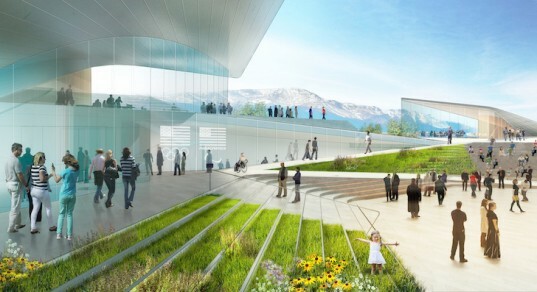 A concept design for the United States Olympic Museum shows extended walkways and a view of Pike's Peak. An extensive outdoor public plaza will be part of the US Olympic Museum project in Colorado Springs, CO.